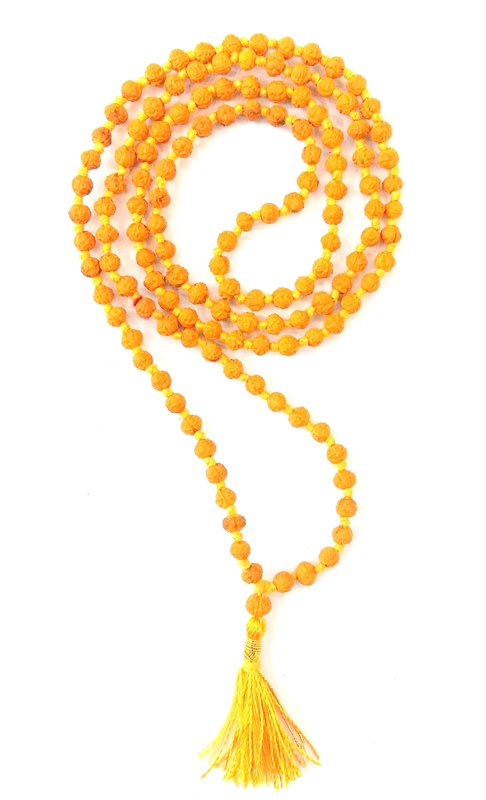 The small Rudrani beads in this mala represents the female aspect of the Rudraksha, representing Lord Shiva’s ability to manifest Shakti, the active and dynamic energetic qualities of Divine feminine power.The tiny beads of Rudrani which are rare to find and are wonderful in effect are said to be the female part of the Rudraksha. It is kept in puja rooms along with Rudraksha to get the results of the totality of the Shiva – Parvati jori. Those who keep this jori in their place of worship get all the material pleasures in this birth and salvation after death. Rudrani beads, sacred to Sri Parvati, are considered the feminine counterpart to rudraksha beads, sacred to Lord Siva. Keeping or wearing rudrani and rudraksha malas together combines the auspicious energies of Sri Siva and Parvati, the Divine Father and Mother. These energies help to harmonize the energies of husbands and wives as well as the feminine and masculine energies within the individual. This mala consists of 108 rudrani beads strung together with silver links and caps, along with an extra “guru” bead. Silver is a divine metal associated with Saraswati Devi as well as the moon. Silver is an excellent conductor of divine energy and also infuses the aura with a very soothing and healing nectar-like energy. Both the rudrani beads and silver work together to calm the mind, allowing Divine Mother’s blessings to flower beautifully in your consciousness. Although this mala has 108+1 beads and can be used for mantra japa, you may prefer to wear it around the neck as a sacred necklace. The gemstone beads will attract cosmic energy and transmit that energy into your body and aura. The 108 beads in the mala will purify and energize all main energy centers in the subtle body, filling them with divine nectar and helping you to achieve a refined and elevated state. Wearing a rudrani mala during any sacred activity, like a puja, homa or meditation, will allow you to attract and retain the divine vibrations of that activity to a very high degree. Whether used for japa or worn as a sacred necklace, this rudrani mala will help you to release all negativity and attract all positive and auspicious energies. Your spiritual qualities will flower beautifully, your meditation will deepen, and your awareness of the Divine will expand. The more mantras and prayers you recite with this sweet rudrani mala, the more divine energy you will attract into your life for peace, truth and loving compassion.